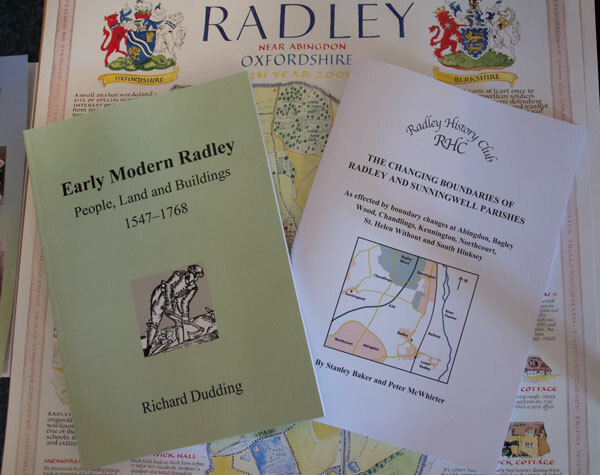 Two new books from Radley History Club: Early Modern Radley by Richard Dudding and The Changing Boundaries of Radley and Sunningwell Parishes by Stanley Baker and Peter McWhirter. Land is the common theme of two new books from Radley History Club launched today, Saturday 17th May. The launch at Radley Village Hall gave people a chance to meet the authors, learn more about the books and buy copies. In The Changing Boundaries of Radley and Sunningwell Parishes, Stanley Baker and Peter McWhirter draw on their studies of old maps and documents to describe the evolution over the centuries of the bounds of these two neighbouring villages. In Early Modern Radley: People, Land and Buildings 1547-1768, Richard Dudding tells the story of the emergence and disappearance of Radley’s yeoman farmers and gives a detailed picture of the village over two centuries, based on his analysis of records, estate surveys and evidence from surviving buildings. Early Modern Radley. Click here for more details. The Changing Boundaries of Radley and Sunningwell Parishes costs £6. To buy a copy, please contact Club chairman, Christine Wootton (email: chairman@radleyhistoryclub.org.uk). Early Modern Radley: People, Land and Buildings 1547-1768 costs £12. To buy a copy, please contact the author and Club vice-chairman, Richard Dudding (email: richard.dudding@btinternet.com). Alternatively both books are on sale at Radley Village Shop. They will also be on sale at the History Club stall at Radley Fete. 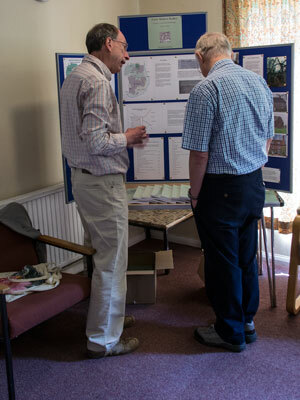 One of the authors, Richard Dudding (left) introducing his new book to a member of the public at the Radley History Club book launch on 17 May 2014.